There isn’t a good history of writer couples. Think of the Fitzgeralds. Think of Plath and Hughes. But here I am—knock on wood—married to the poet Katherine Riegel for the past 11 years. I can say, without doubt, that our relationship has shaped me as a writer. If we had never met in Carbondale, IL, those many years ago, I might be teaching high school somewhere, or back in Chicago working at a camera store. Katie is my creativity fuel, my muse, my motivation. I can also say, with certainty, that without me, Katie would still be a poet. You may know by now that Katie has gotten her second book of poetry accepted for publication. But you don’t know how much we are in fierce competition with each other, and how I need to have my second book come out at the same time. That said, would you guys be interested in taking a look at my essay collection, Southside Buddhist? By the way, I’m kidding. Only a little. But seriously, you interested? We have learned how to be with each other. We know that I prefer the left side of the bed. We know that she hates June bugs. We know that I hate spiders. We know that she has to figure out tips on checks at restaurants. We know that I will have to cook most meals. We’ve also learned what to say about each other’s work. This took years. We are both stubborn in our own ways, and believe, most of the time, that we are right. Katie is more outwardly stubborn. I’m more inwardly stubborn. She voices her displeasure. “You’re wrong,” she’ll say. I keep it inside. “You’re wrong,” I’ll say on the inside. Now we have a system. It’s really not a system. We tell each other our work is the best on this planet. No other writers rival our brilliance. And together, we are like those Japanese animes where we can join and become an ultimate power. We’ve come to know other writing couples: Jon and Allison, Chad and Jennifer, Jeff and Margot, Stacy and Adrian, Aimee and Dustin, Michael and Catherine. Sometimes we go on writing couple dates where most of the time we talk about TV. Writers love TV. TV and food. We are known as Katie and Ira, a two-headed writing beast. She is the phoenix, and I am the dragon. At readings or conferences, if we are not together, people will say, “Where is __________________?” This happens a lot to writing couples. One of our friends once said, “We’re taking a break,” and this caused such a stir that soon the writing world was abuzz. “Did you hear? So and so are breaking up!” It was the best joke ever, she said. When we appear by ourselves, it is to others as if we are suddenly without a limb. I write about Katie often because I write about what it means to belong to two cultures—Thai and American. Katie, however, very seldom writes about me. When we were first dating, I’d say, “Write a poem about me.” I’d say, “You must not love me because I’m never in your work. I love you because you’re always in my work.” She’d shake her head. “Listen, if I begin writing about you, that means our relationship is not doing well. I only write about bad relationships.” This is true. Eleven years later, still nothing written about me. Ira Sukrungruang is the author of the memoir Talk Thai: The Adventures of Buddhist Boy and the poetry collection, In Thailand It Is Night, which won the Anita Claire Schraf Award. He is the recipient of the New York Foundation for the Arts Fellowship in Nonfiction Literature, an Arts and Letters Fellowship, and the Emerging Writer Fellowship. His work has appeared in many literary journals, including Superstition Review, The Sun, and Creative Nonfiction. 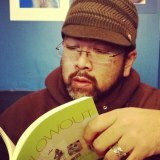 He is one of the founding editors of Sweet: A Literary Confection (sweetlit.com), and teaches in the MFA program at University of South Florida and the low-residency MFA program at City University in Hong Kong. Ira is a fantastic writer, and Katie is marvelous as well! This blog about the Kat-Ira or IraKat dream team is a fun read. I’d like to read one from the Katie’s perspective. i love the letter to publisher/friend. too funny. I love the letter to Publisher/Friend as well. What a wonderfully mutual, symbiotic relationship! I find this very interesting. I absolutely love that letter 🙂 Good job. Wow, what a great piece of writing. I absolutely love your work Ira and Katie. Great job, keep it up!